An interesting new book has just been released that deals with one famous episode of the difficulty of assigning scientific credit in economics. 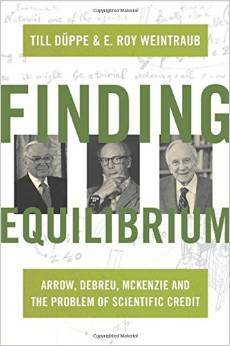 Finding Equilibrium by Till Duppe and E. Roy Weintraub deals with the allocation of scientific credit over the proof of the existence of a general equilibrium in a competitive economy. Ken Arrow and later Gerard Debreu won Nobel prizes for their joint work while Lionel McKenzie missed out for his individual work published around the same time. This book isn’t for everyone but if you are interested in this particular episode in the history of economic thought and the impact of mathematics on economics, then it is a good and informative read. The bottom line is that Arrow comes out well, Debreu not so much and McKenzie comes out as shafted. In the end, however, I wondered if the ‘controversy’ really demonstrated the importance of scientific credit and rewards like Nobel prizes or that they don’t seem to matter much. For starters, there was no Nobel prize when these three conducted their research so it couldn’t have motivated them. But it was also very unclear whether the conjectured mis-assignment of credit impacted negatively on others thereafter. Did we see more credit fights? Did we see more collaborations to bring it together? I’m just not sure. That said, there is a tale in the book of the delay of Nash’s prize and that seems potentially more interesting.